The Northern Triangle countries of El Salvador, Honduras, and Guatemala remain among the most dangerous countries in the world, despite targeted efforts over the past few years to combat violence.9 For example, in mid-2016, El Salvador implemented “extraordinary measures,” including cutting off contact between imprisoned top gang leaders and the outside world to prevent them from issuing orders.10 The United States invested nearly $2 billion during fiscal years 2015 through 2017, with bipartisan support to improve citizen security and the rule of law in Central America. 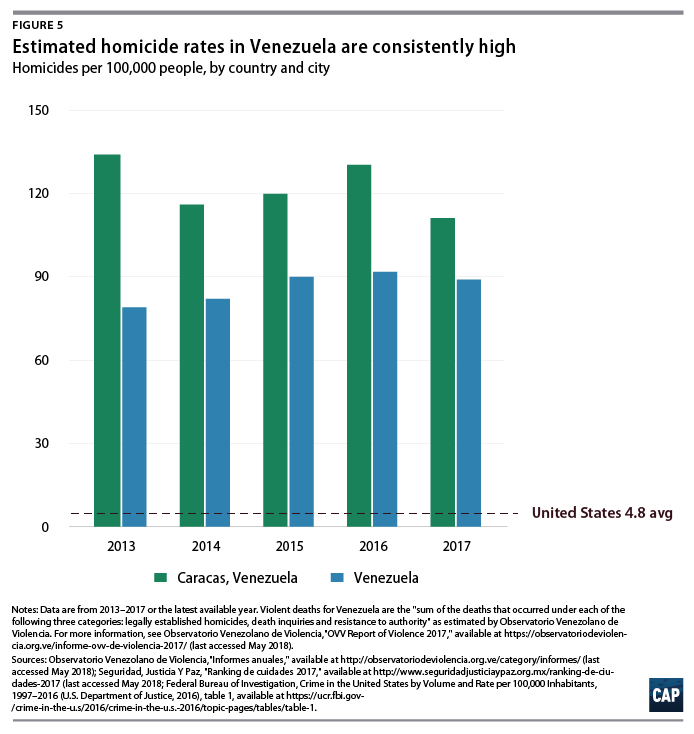 This investment went hand in hand with the region’s own efforts to combat various challenges: the Alliance for Prosperity initiative.11 While homicide rates showed signs of improvement in these three countries in 2017, the epidemic of violence is far from over.12 In mid-2017, for example, several news outlets reported that El Salvador saw a disturbing increase in killings targeting relatives of security forces in retaliation for implementing tough measures in the prison systems, which raises questions about whether the downward trend in violence is reversing.13 Most notably, the total number of homicides in the first quarter of 2018 is 14 percent higher when compared with the same time frame in 2017. Hundreds of thousands of people have left the Northern Triangle region in the past few years and sought asylum elsewhere. 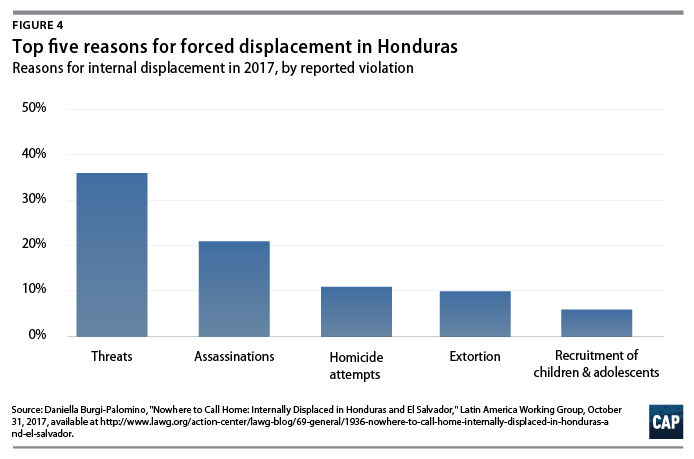 According to the data collected by the U.N. High Commissioner for Refugees (UNHCR), the total number of asylum applications registered by citizens of El Salvador, Honduras, and Guatemala to other countries increased more than elevenfold from 2011 through 2017.22 During that same time frame, there has been a 1,500 percent increase in people from these three countries seeking asylum in Central American countries such as Belize, Costa Rica, Nicaragua, and Panama. The largest percentage increase in asylum applications from people in these three countries is seen in Mexico, with an increase of 1,970 percent. Over this same period, the United States experienced an increase of 1,089 percent in asylum applications from Salvadorans, Hondurans, and Guatemalans. 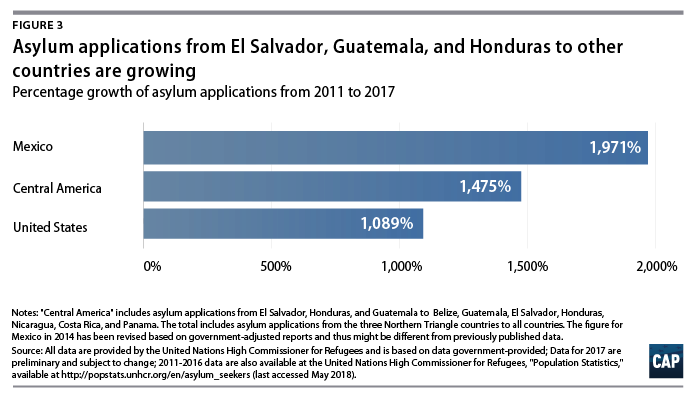 The Northern Triangle countries were among the five countries with the highest number of citizens seeking asylum in the United States in 2016. The UNHCR recently reported a 58 percent increase from 2016 to 2017 in registered asylum-seekers and refugees from the Northern Triangle region, with more than 294,000 people seeking safety globally.23 Additionally, the UNHCR noted that from 2011 to 2017, 350,000 people from this region had filed for asylum worldwide, with more than one-third—130,500—applying in 2017. While the significant numbers of people fleeing the Northern Triangle countries are evidence of the extreme conditions in the region, many others have fled from their homes and are internally displaced elsewhere in their home countries for those same reasons. Estimates by the Internal Displacement Monitoring Centre suggest that each of the Northern Triangle countries has many internally displaced people (IDP).27 Among the three countries, only Honduras officially recognizes IDP as an issue, and even there, IDPs are likely undercounted because they are often not willing to come forward fearing retaliation from gangs.28 According to a 2017 survey by the National Commission on Human Rights, the top reasons for internal displacement in Honduras are threats, assassinations, and homicide attempts.29 Yessenia, a 56-year-old teacher from Tegucigalpa, the capital of Honduras, left her job and home for fear of reprisal after she witnessed a group of young men beating one of her students.30 There are many like her; the possible large presence of IDP, many of whom attribute their status to human right abuses, highlights the extent of the problem in Honduras. 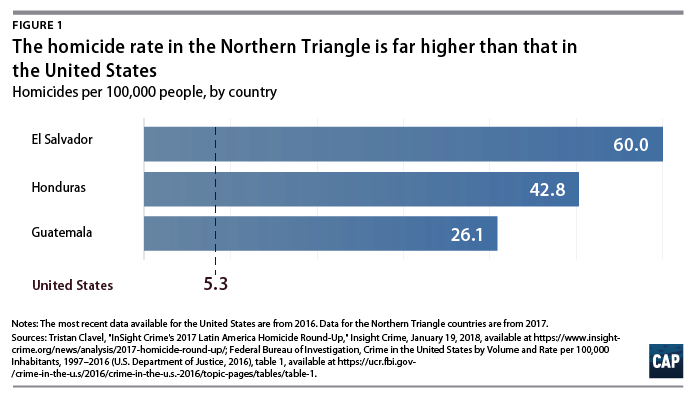 The situation in Latin America is shifting, but the Northern Triangle region is still considered to be one of the most dangerous regions within Latin America, one that is producing significant numbers of refugees. But the Trump administration, rather than recognizing the need to do more to stabilize countries in the region and protect those seeking asylum, is taking actions that will actually worsen the situation. 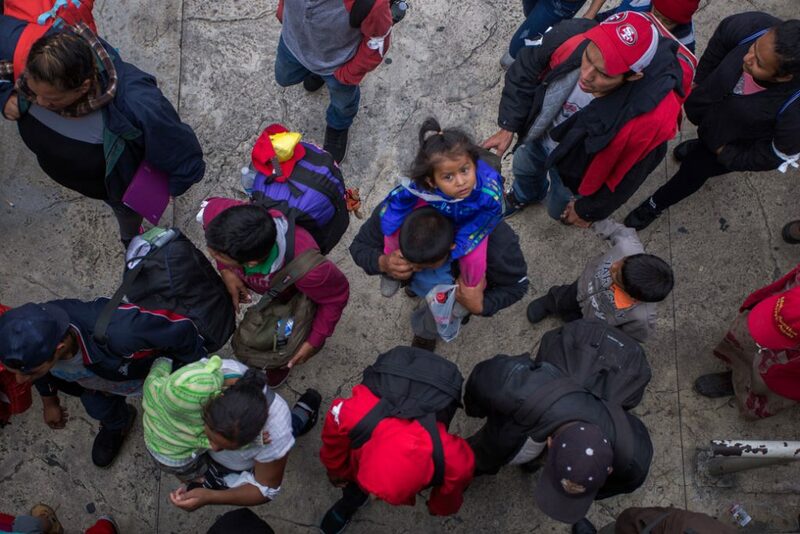 Last month, President Donald Trump floated the idea of cutting U.S. aid to Honduras in response to the caravan—aid that the United States provides in an effort to increase stability and security in Honduras to deter future migration.44 And by ending Temporary Protected Status (TPS) for both Honduras and El Salvador, the administration has placed a total of about 250,000 people who have lived and worked lawfully in the United States for nearly 20 years at risk for deportation in the months ahead.45 Potentially sending hundreds of thousands of people to their home countries, which are in no position to reintegrate them, will only make matters worse for the region.46 Ending TPS has the potential to undo any meager progress toward stability that these countries have made. Silva Mathema is a senior policy analyst of Immigration Policy at the Center for American Progress. The author would like to thank Adam Isacson from the Washington Office on Latin America; Daniella Burgi-Palomino from the Latin America Working Group; and Tom Jawetz, Philip E. Wolgin, Dan Restrepo, and Michael Werz from the Center for American Progress for reviewing this brief; Anneliese Hermann from the Center for American Progress for providing research support on Venezuela; and Alice Farmer, Noha Khalifa, and Ivan Cardona from the U.N. High Commissioner for Refugees for providing additional data on asylum-seekers.